This trampoline ladder calculator only works if your measurement is accurate. To measure the height of your trampoline, you just need a metric tape measure. 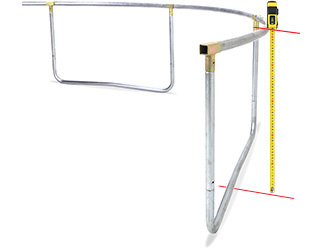 Measure from the base of the trampoline (the ground) to the top of the frame, as shown in the image below. Using this Ladder Calculator will help eliminate guesswork. Approximating or guessing will distort the outcome!